Pirelli, which recently inked a partnership with pro continental team Aqua Blue Sport, has revealed a new partnership with the Mitchelton-SCOTT cycling team, currently number two in the UCI World Tour ranking. The debut will take place in just over two weeks at the Tour de France, where most of the athletes in the Australian team will be using the new Pirelli tubular tyres. The partnership was announced at a press conference attended by Antonella Lauriola, COO of Pirelli Velo, Piero Misani, chief technological officer two wheels Pirelli, Mario Isola, head of car racing Pirelli, and Simon Yates, one of the top athletes in Mitchelton-SCOTT. 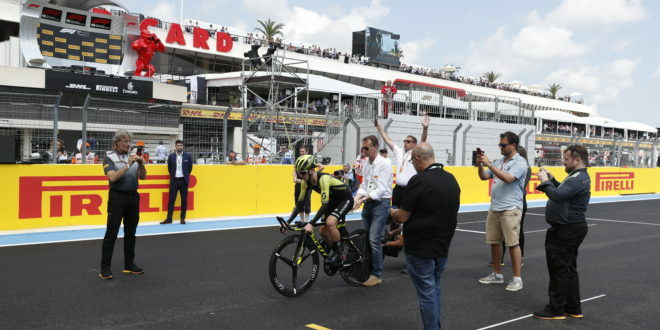 To celebrate the agreement, Yates completed a lap on the Paul Ricard circuit riding his Scott bike fitted out with the new Pirelli tubulars. During the months leading up to the Tour de France, the Mitchelton-SCOTT team and Pirelli R&D personnel have been working together, in a constant exchange of technical feedback, with a total of 300,000 km covered with the new tubular tyres, in races and testing sessions conducted jointly by Pirelli professional testers and the team riders, and several World Tour races already ridden without showing the brand name.